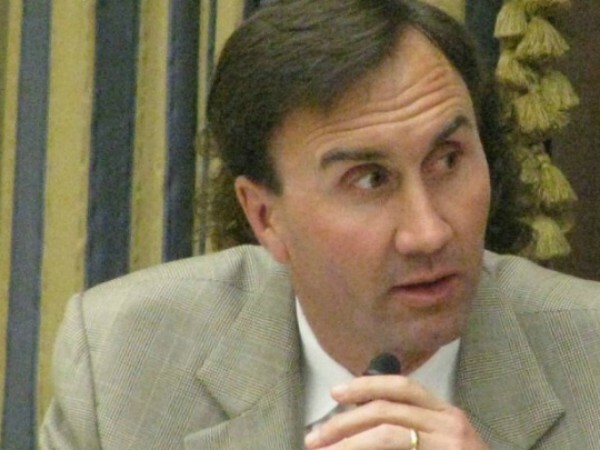 By W. Gardner Selby on Wednesday, December 27th, 2017 at 11:19 a.m.
A baseless claim by Texas Rep. Pete Olson, R-Sugar Land, shown here at a NASA hearing, touched off what proved to be the No. 1 most-clicked PolitiFact Texas fact-check of 2017 (HOUSTON CHRONICLE photo). A Houston-area congressman touched off the most-clicked PolitiFact Texas fact-check of 2017 when he suggested that Bill Clinton intimidated the government’s lead lawyer into not seeking an indictment of Hillary Clinton by telling her, "We killed Vince Foster." Rep. Pete Olson, R-Sugar Land, jawing on the air with Houston radio host Sam Malone, suggested the former Democratic president in 2016 warned Attorney General Loretta Lynch to back off. "I guarantee you," Olson said, "they had the conversation where he basically said, ‘Mrs. Lynch, call your attack dog off. We’ve killed people. We killed Vince Foster. We destroyed Webb Hubbell. We will destroy you.’"
Foster, a White House lawyer at the start of Clinton's presidency, committed suicide in 1993. Olson said in a written statement and interview that he’d taken his accusation a step too far and out of bounds. Truth-O-Meter rating: Pants on Fire! Based on reader clicks on PolitiFact Texas fact-checks, which team reporters and editors for the Austin American-Statesman, Houston Chronicle and San Antonio Express-News, this year’s most-read fact-checks were dominated by a senator who’s seeking re-election in 2018—though a claim quoting a congressman no one ever heard of also made the rankings. Gov. Greg Abbott in August saluted Jerry Jones, owner of the Dallas Cowboys, for telling players to stand for the national anthem or they’d be fired. Jones in 2016 expressed disappointment in Colin Kaepernick not standing for the anthem. But we found no sign of Jones telling players to stand or be fired. U.S. Sen. Ted Cruz told a Texas crowd he no longer supports requiring 60 Senate votes to end a filibuster. After confirming that Cruz previously called for protecting the threshold, we moved to rating his latest position as a flip-flop on the PolitiFact Texas Flip-O-Meter. A reader asked us to verify that a Texas congressman tweeted that he couldn't wait for the next 9/11 so liberal appeals judges would be shown up. We found this claim fictitious; the described representative, Rob McCaskill, doesn't exist. Sen. John Cornyn responded to a voter by saying Obamacare premiums had more than doubled in a few years. That conclusion was supported by a federal analysis. But the study was incomplete in not considering premium changes in 11 states, each one running its own Obamacare insurance marketplace. Democrat Beto O’Rourke, hoping to deny Cruz a second Senate term in 2018, said in August that polls showed him running neck and neck with the incumbent. A single poll, taken in April, showed each candidate favored by 30 percent of respondents--yet 40 percent took no side. Also, we found that the poll didn't survey enough Republicans. Rick Perry, the former governor serving as U.S. energy secretary, told reporters that France won’t import Texas beef but, to its credit, draws 76 percent of its energy from nuclear power. Perry was right about nuclear energy. Otherwise, we found, all of Europe hasn’t imported hormone-grown beef for nearly 30 years. Yet other U.S. beef is allowed in, presumably including some Texas boeuf. In a speech, Cruz said the first Congress required every able-bodied man to own a musket. We found that a subsequent Congress advanced a more limited mandate directing states to establish militias comprised of men aged 18 to 44 bringing their own muskets. The law also excused various officials including the vice president. Cruz, after the Sutherland Springs shootings, said Barack Obama’s administration had prosecuted few people for lying about their felony records in order to purchase guns. A study suggested as much, we found, also revealing that prosecutions were rare before Obama’s tenure. State Rep. Shawn Thierry, D-Houston, said Texas leads the nation in the rate of mothers dying in childbirth. A 2016 study bore this out. But that analysis took into account deaths at childbirth plus deaths during pregnancy and up to 42 days after delivery. Notice a fresh claim that might merit a fact-check? Email us or message us on Twitter or Facebook. Each of the most-clicked fact-checks appeared on the PolitiFact Texas website and, in print, in the Austin American-Statesman.